1959 – A forest fire engulfs the San Bernardino National Forest. In the aftermath, several injured animals were found that required care. A makeshift hospital/rehabilitation area called the Wildlife Habitat was set up on land where the zoo currently resides. Loris Cady, developer of Moonridge Mountain Estates, Inc., built the first two cages. The new facility was overseen by the workers at the local ski area. At the time, the area was open forest which allowed the animals to heal in their natural environment. An orphaned 30 pound baby black bear and two bobcats were the first residents of the future Zoo. 1960 – Moonridge Mountain Estates, Inc., agreed to a 50 year sub-lease between Big Bear Valley Recreation & Park District and Moonridge Golf & Mountain Club, Inc. who was in a 99 year lease with Moonridge Mountain Estates. 1960 – Moonridge Mountain Estates, Inc. sends a letter to the Park District offering to keep up the “animal deal” in the Moonridge District during its early stages. They offered to cooperate in every way to keep expenses down to a minimum and were willing to feed and take care of the animals. They only expected the Park Board to reimburse the cost of food. Water would be supplied by the water company for $3.50 per month (when available). The letter suggested some sort of insurance be looked into when the park was opened. 1960 – The Park District Board allocates $5,000 for the development of the new zoo but decided to hold off until a maintenance cooperative agreement is reached with Moonridge Mountain Estates. 1960 – District Budget allocates $2,021.74 for the zoo: $823 for a bear enclosure; $726 for a deer enclosure; $293.74 for a water line; and $179 for a duck pond. 1961 – Plans were drawn for the zoo by M.G. Sutter, Engineer. 1961 – The first zoo supervisor was hired. 1961 – A request was sent to Department of Fish and Game requesting animals and game for the zoo. Fish and Game advised that there was a nuisance bear in the San Gabriel Mountains which they would trap and send; a bear cub was acquired. 1961 – The zoo was fenced, 2 cages built and water lines were installed. 1961 – A deer enclosure was built. 1961 – The facility is named Moonridge Zoo. 1961 – A black bear was lassoed out of a tree during the forest fire at Barton Flats and was named Herman; Herman was to became of the most famous residents. 1962 – Three silver foxes were donated to the zoo by Mr. Tom Marks. A plaque in Mr. Marks’ honor was placed on the pen. 1963 – An application was sent to the County Planning Commission for the Moonridge Zoo site approval along with a $50 fee. 1963 – The creek channel was graded and the dam and pond were completed. 1964 – The zoo was landscaped with bushes and trees and restrooms were installed. 1965 – A new bear den was built to house “Herman”. 1965 – Horseback riders rescue a baby fawn that was attacked by a coyote on Skyline Drive and it was brought to the zoo. 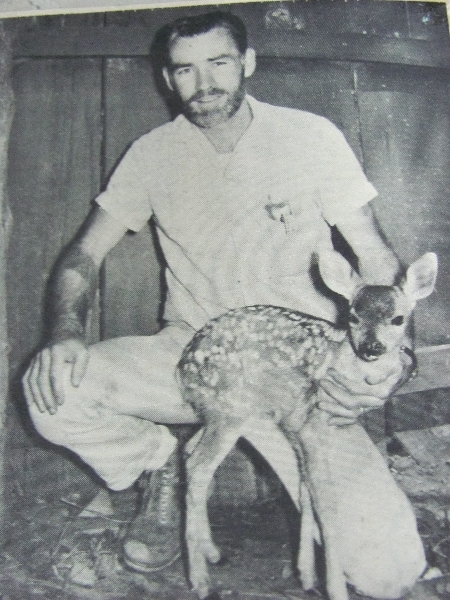 1966 – The district hires Mr. Harold Darling as zoo supervisor/care taker. Mr. Darling was the sole caretaker of the zoo and the animals for several years. 1966 – The zoo received permission from the Department of Fish and Game to keep golden eagles at the zoo. 1966 – Attendance of 491 visitors reported over the Memorial Day weekend. 1967 – The eagle aviary was built. 1967 – Safeway Stores opens in the Big Bear Valley and donates all unsold produce to the zoo. 1968 – A contribution box was put in place (on a trial basis) to help feed the animals. 1968 – Although entrance to the zoo is free, there is a strict no picnicking policy. 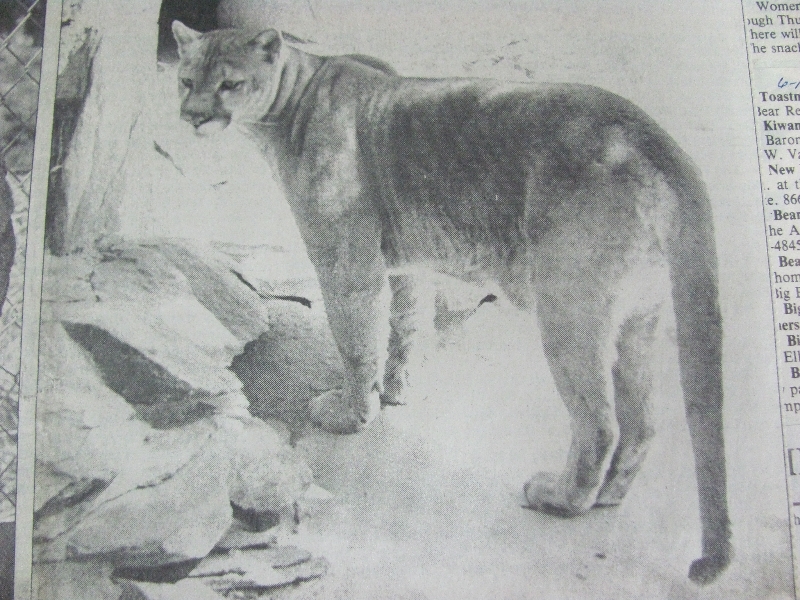 1969 – Mountain lion enclosure completed, a deer shelter and warehouse was built. 1970 – Bridges were built over the creek. 1970 – Four aviaries were constructed; split rail fence was installed at the entrance. 1971 – Herman the bear has an abscessed tooth removed. 1972 – A raccoon enclosure built. 1972 – Attendance of 3,000 visitors reported over Memorial Day Weekend. 1973 – Five small enclosures were constructed to house the foxes and coyotes. 1973 – Zoo closed for the winter months. 1973 – Mr. George Toth (movie animal trainer) stores his movie animals at the zoo in his own cages. 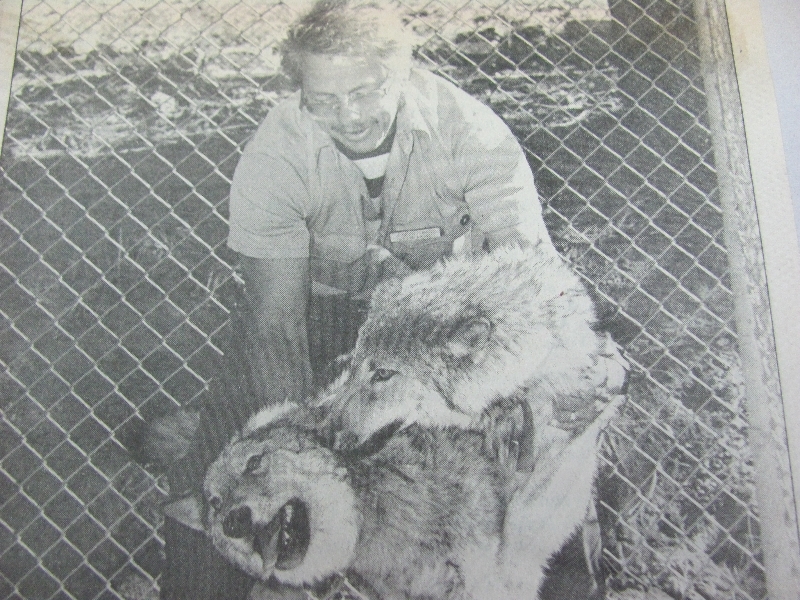 1973 – George Birdsell, Park Board Member, local animal tracker and Department of Fish and Game representative supplies the zoo with captured coyotes and bobcats. 1975 – Exhibitor Certificate License #930-89 was received from the Department of Agriculture . 1975 – Zoo property was offered to the Park District Board for $15,000 per acre. The board determined that there was 35 years left on the lease at $1.00 per year and declined the offer. 1976 – Cal Poly students in the masters program work as interns rehabbing two bear cubs for return to the wild. 1976 – Parking area is paved. 1976 – Peacocks, chickens, ducks and turkeys wander grounds freely. 1976 – Sewer connected for restroom hookups. 1977 – Zoo closed to the public for the winter. 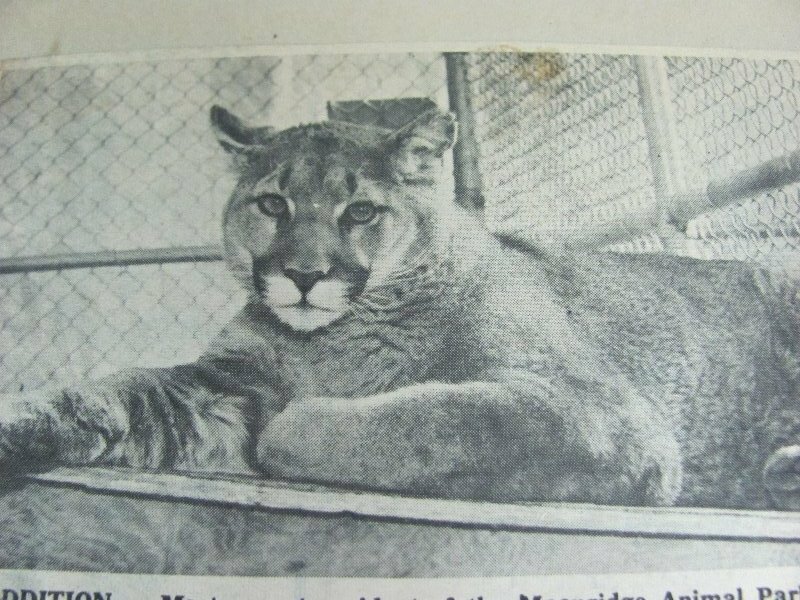 1977 – Five mountain lions were born at the zoo and were taken at a very early age to Cougar Hill Ranch training center for the movie industry. During their first week, they starred with Farrah Fawcett in a car commercial. 1978 – Three men were hired to man the zoo; their schedule was staggered so someone was always on site. 1978 – A donation box was installed and $728.82 was collected in one month. 1978 – Due to the passing of Proposition 13, the Zoo was open on weekends only. 1979 – United States Department of Agriculture requires a signed agreement with a consulting veterinarian to inspect the facility and instill a program of disease control and prevention. Dr. Harold Stephens is the first Veterinarian of Record for the Zoo. 1980 – District receives proposal from Mr. George Toth, owner of Cougar Hills Ranch in Littlerock, to lease the property. Mr. Toth proposed to replace all existing animals with retired movie animals and retain all rights to the zoo. Animal shows would be done 3 days a week and a petting zoo installed. The District rejects the proposal. 1981 – During baby season at the zoo, two baby great horned owls were brought in, a bobcat had a litter of kittens, and a wolf gave birth to two pups. Both the bobcat and wolf litters were given to George Toth for use in the movie industry. 1981 – USDA requires the zoo to increase housing and shade for the bobcats. 1981 – Mr. Harold Darling retires after 15 years at the zoo. 1981 – Joseph Duret becomes the Zoo Director. 1981 – The zoo becomes a “Class C” exhibitor with the Department of Fish and Game. 1982 – Zoo tours, which have always been very popular with Big Bear school kids, are requested from schools throughout San Bernardino County. 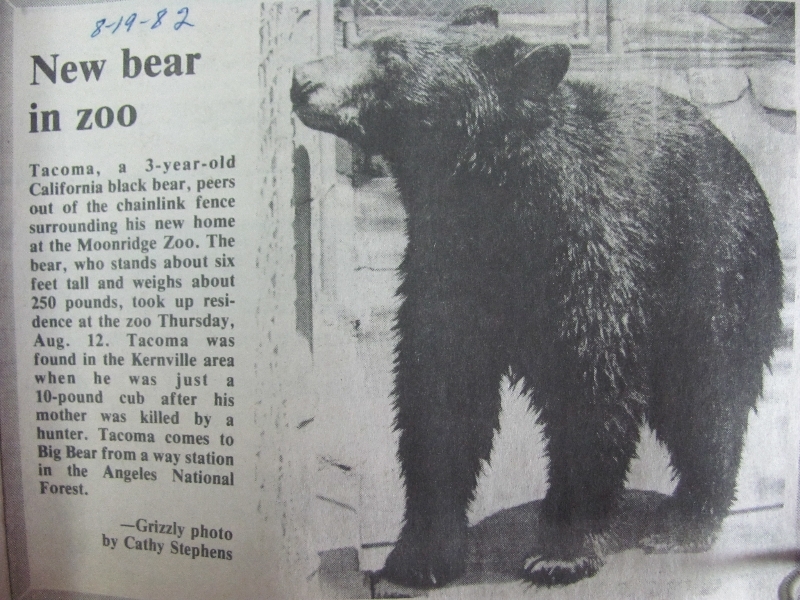 1982 – Herman the Bear is euthanized due to several health complications on February 25th. 1982 – District receives a call from the Wildlife Way Station in Los Angeles asking if we need any animals. A bear is requested and Tacoma the black bear joins the family. 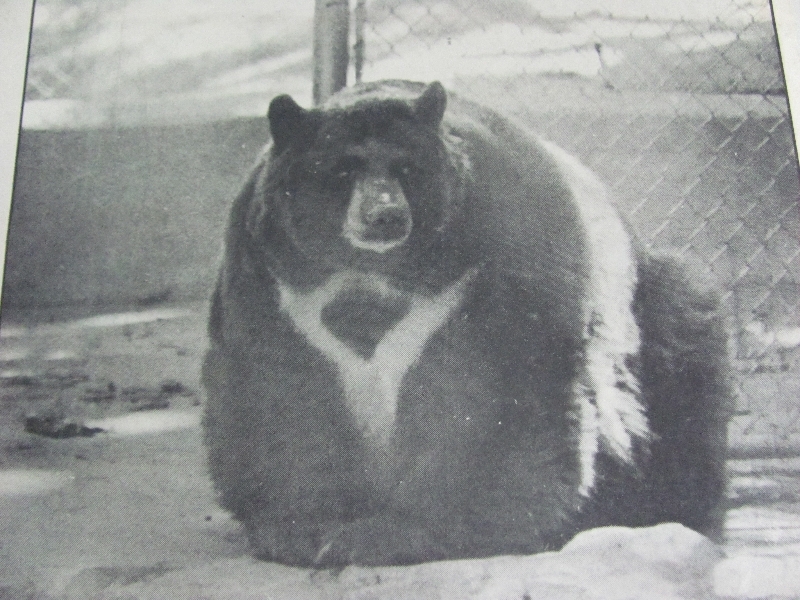 1982 – Jiggers the bear, who was suffering from poor heath, was taken to LA Zoo for x-rays. It was determined that nothing could be done surgically and Jiggers was brought home and put to sleep on October 21st. 1983 – Three peacocks escape from the zoo and enjoy a day of freedom wandering the streets of Moonridge. 1984 – On July 18, severe storm floods the zoo destroying fences, cages and walkways, forcing the facility to close for major restoration. California Conservation Corps lends a tremendous hand during the repairs. 1985 – A cement spillway, flood control culvert, and cement walkways were installed, the bear dens were improved and a new coyote den was built. 1985 – A female wolf, Nakita, was stolen from her enclosure by two men who had offered the Zoo Director $400 for her earlier in the day. When he refused they commented that they would get one, one way or the other. While the Director was occupied cleaning out the bear enclosure, the men from Newport Beach jumped the fence, cut the chain link with a large tool and pulled her out of the enclosure and left the zoo. She was found four months later when one of the men was fired from his job and the supervisor called the authorities and reported that the man said he had stolen the wolf from the Big Bear Zoo. The man was convicted of grand theft and spent time in jail for the crime. Nakita was returned unharmed. 1986 – A District policy was instituted that the zoo only accept injured and impacted alpine animals. 1986 – The first bald eagle, Stumpy, who lost his leg in a wolf trap, arrived at the zoo courtesy of Alaska Airlines. The eagle, scheduled to be euthanized, was saved by a Big Bear resident who worked for the Wrangle Ranger District in Alaska. 1986 –The parking area was paved and bird enclosures remodeled. 1988 – Three bald eagles are stolen from the zoo and were found massacred in a ritual sacrifice on the shores of Big Bear Lake. 1989 – The Friends of the Moonridge Zoo was established in 1989 as a nonprofit 501(c)3 organization. The Friends of the Moonridge Zoo’s mission is to support the Moonridge Zoo by inspiring understanding, respect and environmentally responsible action for the conservation of wildlife and wildlife habitat through public education, volunteer support, fundraising and development, and key project financial support. 1992 – The zoo enters into a breeding loan agreement with the Zoological Society San Diego for Wood Bison. Cochise and Geronimo were successful in breeding with the birth of Koiwa and Norman. 1994 – A Memorandum of Understanding is entered into between the Moonridge Zoo and the California Department of Fish and Game for rehabilitation of native sick, injured or orphaned birds and mammals. 1994 – Don Fredde of Pasadena donated a guard/ticket booth to the zoo. 1994 – By request of the zoo veterinarian, Dr. Kim Hickman, the mule deer exhibit was moved into the interior of the zoo – moving the stressed deer away from the mountain lion exhibit. 1994 – The District hires a consultant for the “Living Forest Task Force” to help evaluate potential zoo sites. 1994 – Curator Don Richardson is hired. Animal diets are improved and enclosures changed to imitate the animals natural environment. 1995 – Negotiations begin with the Department of the Interior about acquisition of 1 adult female grizzly bear and her two young cubs which were being housed at the Woodland Park Zoo in Seattle Washington. 1995 – Living Forest Task Force meets with Bear Valley Unified School District and asks approval to utilize 11.1 acres of school property for the new zoo site. 1995 – The black bear exhibit is expanded. 1996 – The zoo enters a loan agreement with Micke Grove Zoo in San Joaquin to accept a Snow Leopard “Chago” with the approval of Dan Wharton, the Snow Leopard coordinator for the Species Survival Program. 1997 – The Wildlife Education Center was constructed and opened thanks to the fundraising efforts of the Friends of the Moonridge Zoo. 1997 – County Real Estate Services makes an offer to purchase the current zoo property – offer refused. 1998 – US Forest Service approached about putting the Zoo next to the Discovery Center on Forest Land. 2000 – A medical trailer (infant hospital) is installed on site. 2000 – The District Board reviews the plot plan of the new zoo for the first time. The zoo will be set up in a chronological timeline that coincides with the history of Big Bear. 2000 – Brother and sister timber wolves “Nova” and “Wakiza” arrive at the zoo. They were born in captivity at Wolves and Company for use in the movie industry. 2001 – Memorandum of Understanding is entered into between Big Bear Valley Recreation and Park District, the Friends of the Moonridge Zoo, San Bernardino National Forest Association, and San Bernardino National Forest Pacific Southwest Region USDA Forest Service to establish a framework of cooperation and for the exploration of opportunities to relocate the Moonridge Animal Park from its current location to a site on National Forest System lands in the Big Bear Valley area. 2001 – The zoo’s budget is separated from the Park District’s budget. 2002 – The County Board of Supervisors obligates $25,000 from the priority policy needs budget to the Park District to develop a business plan related to the relocation and operation of the Moonridge Animal Park. 2002 – The County Board of Supervisors obligates $200,000 of HUD funding to the project. 2002 – A Memorandum of Understanding entered into between the Big Bear Valley Recreation and Park District and the Friends of the Moonridge Zoo. 2002 – The Zoo Task Force is formed with 9 members and a facilitator. 2004 – The gate fee is raised to $7.00 for general admission and $5.00 for children and seniors. 2004 – The zoo takes in over $300,000 in admission fees. 2004 – The zoo begins accepting credit cards. 2004 – The zoo takes possession of Fallow Deer from Fish and Game and integrates them into the bison enclosure. 2005 – Black bear Hollybeary arrives. 2006 – The restroom is updated to be ADA compliant. 2006 – Canadian Lynx Aslan comes from CALM in Bakersfield. She was not doing well because of the heat and everyone involved in her transfer believed that the cool, mountain environment would suit her better. 2006 – PGAV is retained by the Friends of the Moonridge zoo to design the zoo. 2007 – Nay Foundation begins contributing to the zoo’s food budget. 2007 – The zoo receives ZAA accreditation. 2007 – The zoo adds Arctic Fox to the collection – becoming one of five zoos in the U.S. to display arctic foxes. 2007 – Zoo admission brings in $15,034 during Memorial Day Weekend. 2008 – Debra Richardson becomes Curator of the Zoo. The bump in revenue allows the zoo to raise staff salaries, hire registered veterinarian technicians and experienced keepers. 2008 – The County Board of Supervisors transfers $5,750,000 from the County General Fund into the Moonridge Zoo Relocation Project for the design, construction and relocation of the zoo. 2008 – A letter was sent to the Forest Service stating that there is no evidence to support the claim that there are “no other suitable sites” available in the region and appears to be insufficient and compelling to justify a special use permit on public forest land. This is found to be true and the Discovery Center zoo location is abandoned. 2009 – Staff is instructed to find suitable property for the new zoo and the search begins. 2009– The kitchen and medical area are remodeled. 2009 – 9 wolf pups were born to 9 year old Wakiza. Note: Wakiza passed away in 2014. 2010 – A new wolf enclosure was build to house the additional pups. 2010 – The County Board of Supervisors approved the purchase of a 10.5 acre property located at the bottom of the Moonridge Golf Course; escrow closed. 2010 – An Environmental Impact Study on future site begins. 2010 – The County enters into a lease agreement with the current owners of the zoo property for three (3) years with three (3) two-year options. 2010 – The proposed Draft Site Plan is competed by PGAV. 2010 – An amphitheater is constructed. 2011 – Community meetings are held to review the draft plans. 2011 – The zoo goes global with a Facebook page. 2011 – Bison Kiowa passes away of old age. 2011 – Snow Leopard Milo passes from cancer. 2012 – The Moonridge Animal Park changes its name to Big Bear Alpine Zoo. 2012 – The zoo rescues black bear “Pooh” who was a nuisance bear and was scheduled to be euthanized for eating $8,000 worth of a grower’s honey. 2012 – The Opossum building is completed. 2012 – The zoo receives a donation of an x-ray machine. 2012 – New mews built for the birds. 2012 – The zoo brings in $13,681 during the Memorial Day Weekend. 2014 – March 25, the San Bernardino County Board of Supervisors approved the adoption of the Mitigated Negative Declaration 5/0, as part of the process for the relocation of the Big Bear Zoo. This was the final step required in the environmental review of the proposed relocation which allows the Special Districts Department to proceed with development of the relocation site. 2014 – The zoo receives Snow Leopard sisters Asha and Shanti from the Woodland Park Zoo in Seattle Washington. The sisters were born into the Species Survival Program with a birth defect that causes both of the right eyes to be removed. Because of the birth defect, they have been removed from the SSP and will live their lives with us at the zoo. 2014 – Entrance fees were raised to cover the cost of staff, supplies and services. Adult $12.00, Children and Seniors $9.00. Five part time keepers become full time benefitted keepers. 2015 – PGAV Destinations is selected for the design of the relocation of the California’s only wild animal rescue and rehabilitation facility of its kind. 2015 – Debbie Richardson, Curator retires after 21 years of service to the Big Bear Alpine Zoo. 2015 – Bob Cisneros is hired as the Curator. He brings with him 21 years experience from the San Diego Zoo. 2016 – Tuesday, May 24 – The San Bernardino County Board of Supervisors votes unanimously to approve the funding and awards the contract for the construction of the new zoo to M.S. Construction Management Group from Dana Point. On Friday, May 27, we officially Break Ground!